Doka underlines its strong position in the highrise sector with some exceptional new projects all over the world. Many of these are destined to join the list of the world’s tallest buildings. The Lotte World Tower (555 m) in the South Korean capital of Seoul is one such, as are the CMA Tower in Riyadh, Saudi Arabia, the Twin Towers in Qatar, the Minerva Tower in the Indian metropolis of Mumbai, Tower 4 of the World Trade Centre in New York and the Torre Intesa Sanpaolo in the Italian city of Turin. This string of sales successes is due in no small part to Doka’s performance on the megaproject Burj Khalifa – at 830 m, the world’s tallest building. With Doka’s self-climbing formwork solution SKE, it took only 30 months to raise this over 600 m tall CIP concrete core. When it comes to ultra-challenging highrise projects like Burj Khalifa, the construction industry looks to formwork technology for innovative solutions that are designed for the very highest cost-efficiency and that meet stringent safety standards. The reason is that overall progress on all such projects depends crucially upon ‘Safe. Fast. Efficient’ construction of the CIP concrete core. Climbing formwork SKE is a tailor-made solution for formwork tasks like these. Doka climbing technology combines cost efficiency with high safety standards. This fact, plus their wealth of experience and planning capability gained over years in the industry, makes The Formwork Experts the partners of choice for every highrise project. No matter how high your requirements – Doka climbing systems take you to new heights. Thank you for your interest - Reaching for new heights, with formwork solutions from Doka. 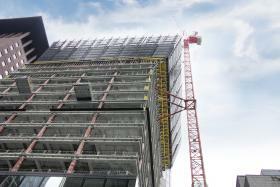 Thank you very much for your interest - Reaching for new heights, with formwork solutions from Doka.